Wedding in Italy: what to start with? 1 Why to get married in Italy? 2 How to plan a wedding? 3 What are the prices for wedding in Italy? Friends and my new readers, I always do my best tot share with you only fresh information, true facts and advice from my own experience. This article is not an exception. Wedding in Italy is quite a broad topic to cover in one piece of text, but even though I squeeze and pick up only the most interesting moments to share with you. All the rest we can discuss with you in a private talk. It is no doubt that Italy is one of the best countries for a destination wedding in Europe, because it has all the facilities and venues available the whole year round for the brides and grooms. With every year more and more couples travel to Apennines to get married. But let’s have a look at what the reasons are, that make people choose this country among the others. Why to get married in Italy? Among all pros of this country its historical and cultural heritage is one of the basic reason to visit. Every year millions tourists from all over the world spend their holidays and vacations there. They taste amazing food, vine and try to discover local traditions, learn and practice Italian language. Lovers enjoy the time spent together in one of the cities: Rome, Milan, Naples and Venice. I think that it is diversity of places that makes people come and get married in Italy. There are numerous facilities for any kind of travellers. Those who are keen on skiing goes to the Alps and enjoy amazing paths and service there. People with less extreme in mind usually prefer calm and peaceful beaches on the seashore. And of course city touring is fascinating. Rome, Venice, Milan, Florence, Naples are biggest cities in the country and the most popular with tourists as well. Also a lot of destination weddings take place in each of them. So lets stop on each destination location in order to learn some facts about Italian traditions, wedding photographers and of course interesting places for the brides to have their big day celebration. For example, you would like to get married in Rome. 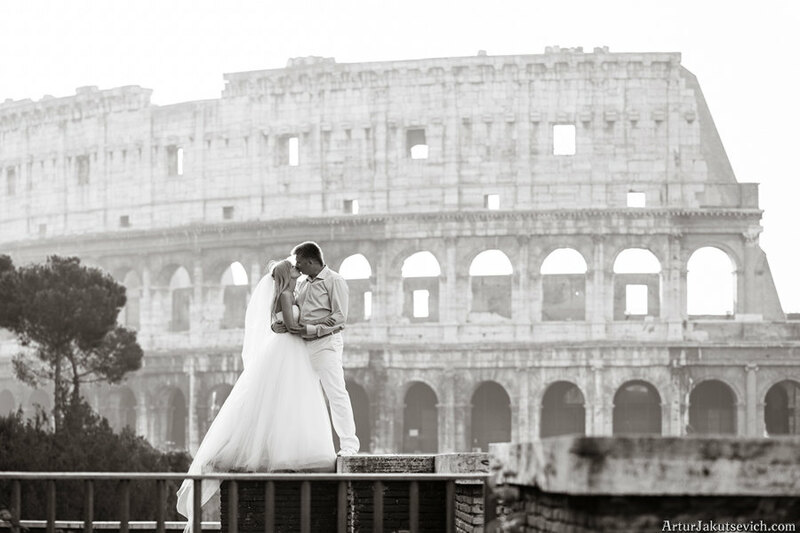 Such a ceremony will be a miracle for any lovely bride and handsome groom, because the decorations for their big day are the ancient ruins of Coliseum, beauty of Arch of Constantine, Pantheon and other attractions of Entire city. There is huge variety of what to do and where to go in Rome after the official procedure. Some inspiration for you. But since we are talking about Italy and Italians we should bear in mind the fact that they are quite hard people in communication and therefore all the planning of any event should start early in advance, especially if it is going to be a big wedding ceremony with quests invited. Here at ARTURJAKUTSEVICH.COM we have reliable partners among professional wedding planners in Italy who arrange and organise magnificent and successful events throughout the country. So in case you would like to have a free consultation concerning the choice of the location and any other issues, feel free to leave your contact data and within 48 hours you are sure to receive an email with information required. Wedding in Venice is an incredible ceremony in very romantic atmosphere with ancient traditions. Choosing this destination wedding location in Italy you plunge into a real fairy tale with cute streets, hospitable people and of course famous channels and gondolas. There are many variants of where to get married in Venice, because the city has a lot of both official and outdoor venues where lovers in Italy can exchange rings and vow to each other. It would be a huge mistake not to find a wedding photographer in Venice able to take photos of your ceremony and the rest of your big day. Don’t forget, that one emotional and lively photo is worthy thousands of posing ones, provided you are not professional actors, who can play love. Any wedding in Florence is a charming and fascinating. In 1982 UNESCO honoured the city with World Heritage Site, because of its historical and architectural importance. Nowadays Florence visit about 2 millions tourists each year. There are a lot of newlyweds among them. Brides choose the capital of Tuscany region as destination wedding location in Italy due to several reasons. First of all the city gave birth to the very popular style of the Renaissance. Thus its architecture is a real masterpiece with amazing buildings and broad squares. Moreover Florence is a very wedding friendly city with vast choice of both indoor and outdoor places to get married. But we should worn lovely brides, that in this city one has to walk a lot to enjoy all the beauty of the place. After the ceremony held according to all Italian traditions, ask your photographer in Florence to visit Pitti Square, Uffizi as well as Plazza della Signoria and you are sure to get cute and lovely pictures. Well, it’s a hard task to find a more suitable city for romantic people where to get married in Italy but in Verona, hometown of Rome and Juliet. For all the fans of Shakespeare and his works a trip to Verona is a unique opportunity to walk along the streets where the most famous love story in the world took place. Therefore more and more lovely brides decide to visit Italy and to plan a wedding in Verona. And to make memorable photos from the ceremony the brides usually book a professional photographer, able to capture the beauty of lovely bride and groom in a magnificent city. Wedding in Milan or Milano, how the Italians name the second largest city after Rome, is a dream of any fashionable lady. The city is considered to be world’s most inflectional and biggest fashion centers; therefore the latest tendencies in dressmaking can be found there. There are a lot of opportunities for a fussy bride to choose the most attractive or extraordinary wedding dress or even to have it made by a well-know designer. Grooms also have a vast choice of various suits for the ceremony. Therefore weddings in Milan are always very luxury and stylish, held according to the latest trends in the field. On the one hand for a photographer in Milan it is a big pleasure to picture lovely brides, but on the other it is huge responsibility, because the result has to be of top quality. Most of the brides besides photo shooting also prefer to have a love story and pre-wedding session. Another very attractive and quite unique destination wedding location in Europe is Como Lake in Italy. This is a dream place for any couple willing to celebrate their big day outdoor. The service they offer in the hotels is of high quality. Just have a look at some of Como Lake photos and fall in love with the place. Your wedding ceremony will be organised and planned according to all your wishes considering the details in everything from invitations and flowers to the musicians performance and dishes served. The climate is very mild therefore couples arrange ceremonies the whole year round even in winter. Everyone gets amazed with the nature around the Lake. Ecologically friendly wedding in Como Lake are popular with couples from different spots of the globe. Garda — is an incredible Italian lake situated between the Alps and takes its waters from the glacier. Moreover Garda Lake is the biggest one in Italy. There are numerous little villages on its banks, where tourists from all over the world like to spend their holidays. Recently it has become very popular to get married in Garda. 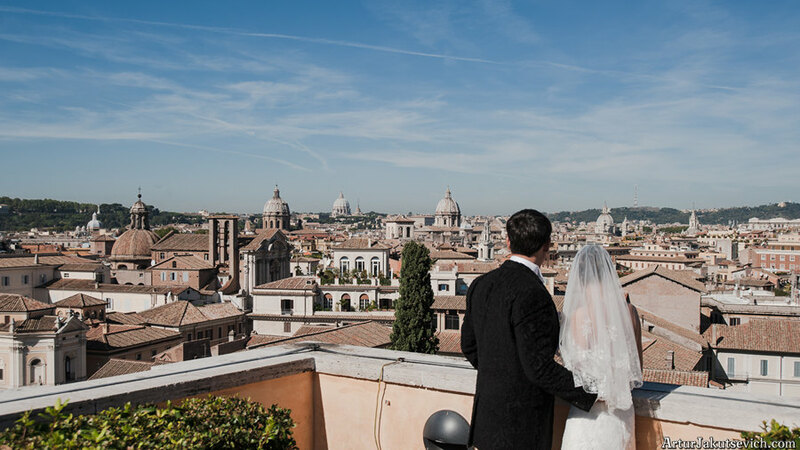 Couples come to Italy from different countries to have either a luxury destination wedding or just a symbolic ceremony just for two. There is enough infrastructure at the lake to organise and hold any kind of events. Therefore I can assure you that you wedding in Garda will be a success. Though you have to make everything in advance. Remember, this is Italy! People do not harry and to book a room in a hotel or a luxurious villa, you need to be quite lucky. Wedding in Sicily is a fairy tale with aroma of oranges and sea. The shore is washed with three seas: Tyrrhenian, Ionian and Mediterranean Seas. With its mild climate Sicily attracts both tourists and sweet couples during the whole year. Amazing beaches with white sands, olive trees and gorgeous hotels, dangerous Etna volcano and rocks crate very picturesque views and incredible atmosphere of the island. There is no other place like Sicily in the whole World; therefore it became so popular with couples willing to have a luxury destination wedding in Sicily and Italy. So basically you have only to choose the place and to book the date. Though, I can only guess how difficult it will be for you to make this choice, since every location in Italy is attractive and quite unique. Therefore, I and my colleague Vladimir, are always open to you and all your questions. You may get our assistance absolutely for free. We will share with you the knowledge and information we have. To make you completely sure, that your big day is going to be held in Italy, just let me show you a video sample, produced by the talented event videographer and my friend Alexander Znaharchuk. What are the prices for wedding in Italy? There are various options for brides willing to have a destination wedding. It all depends or requests and budget. Thus, a big planning has to be done in advance. Lets try to count roughly approximate budget and price of a wedding in Italy. These are very raw prices since for every bride and groom wedding planners can adjust the total number of zeros in the account. But to be on the safe side don’t try to economise your costs by choosing strange vendors for your event, saying that they can make a lot for little money. It never happens in Italy especially. Another very special feature of Italian weddings is early planning. I do mean early planning say this. One or better two ears in advance. Almost all true Italian companies related with weddings work on the bases of “no hurry we work relax”. So, in case you have any questions concerning the issue, feel free to address me and my manager Vladimir. We will do our best to help you to plan your dreamlike and luxury destination wedding in Italy. Please, feel out the contact form and get your questions answered within 48 hours.